Ah, sweat. It gets such a bad wrap. I say this as a person who has spent much of her adult life avoiding it. I used to loathe exercise purely because it meant that I would get sweaty, well that and I would have to wash my hair more often. Those reasons can all be justified, too -- if you’re not on board, I get it, trust me. It took me a long time to be okay with sweating. I used to feel uncomfortable with the dampness of perspiration. It’s the reason why I quit hot yoga, despite how good I felt after. But now that I regularly sweat, I do have to say, it makes a difference. A big one, and not just in how I feel, but also in how my skin looks. Yes, while my post-sweat face is red, I look alive and healthy. Dare I say it? I glow. All of this was reinforced to me again by two separate experiences. First, during the winter I like to boil water, and create an at home facial experience for myself. I pour the boiling water into a heat-safe bowl and add some essential oils (lately I’ve been reaching for peppermint and lemon, which perks me right up), or you could invest in a beauty steam that works like a kettle would. Then you simply put a towel over your head and lower your face over the bowl. Not only is this really lovely when you’re freezing your buns off, or you’re feeling super congested, but it’s also great if you feel like your skin is looking a little congested as well. I often raise my head after a couple of minutes of steaming and dab my sweat to find that my skin looks awake, and my pores are opened. Workouts and facial steams aside, I was looking for another way to get my sweat on so I decided to take the plunge and sit in an infrared sauna for 30 minutes. I booked a session at Chill Space, and was actually pleasantly surprised. I find traditional saunas anxiety-inducing because they are so hot, but infrared saunas, in general are typically cooler. Any fears I had of feeling overheated or unable to breathe way were quickly assuaged. And when I finished my sweat session, I felt incredible -- my skin looked great, rosy but not blotchy, and my mood was downright sublime. All of this from just a little warmth and perspiration. I had to find out why, so I reached out to Dr. Joshua Kantor, a kinesthesiologist, to find out exactly why I felt warm and fuzzy inside, and looked positively glowing on the outside. 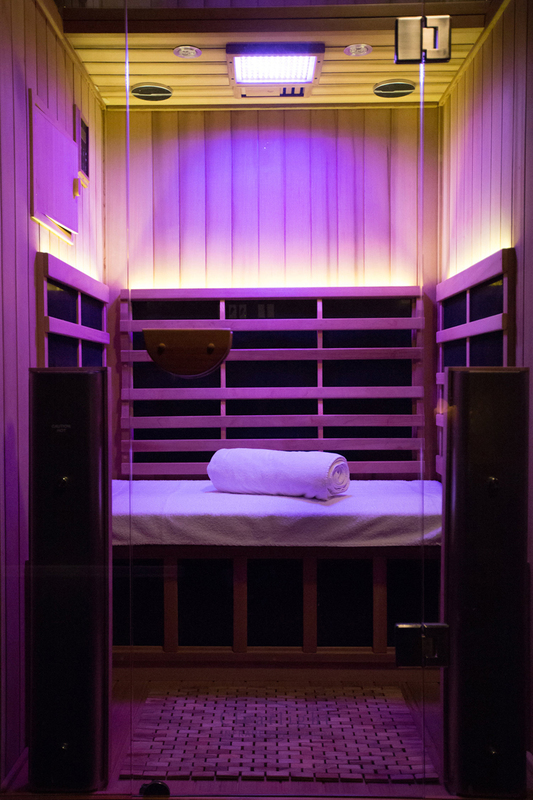 Dr. Kantor explained that the heat of a sauna (or perhaps your shower) causes your body to produce nitrous oxide, which dilates the body’s capillaries thus increasing blood flow. Essentially, you’re oxygenating your entire body, increasing your circulation and promoting cellular detoxification. Sweating, be it just because you’re steaming, or if you are exercising, is not only is it good for your appearance (#Glow) it’s good for your health and your emotional wellbeing too. The best part? You don’t even need to move to get your perspiration on, so lazy girls are welcome, too.